I contemplated letting this bit of news pass without comment, but it just grates on me too much. 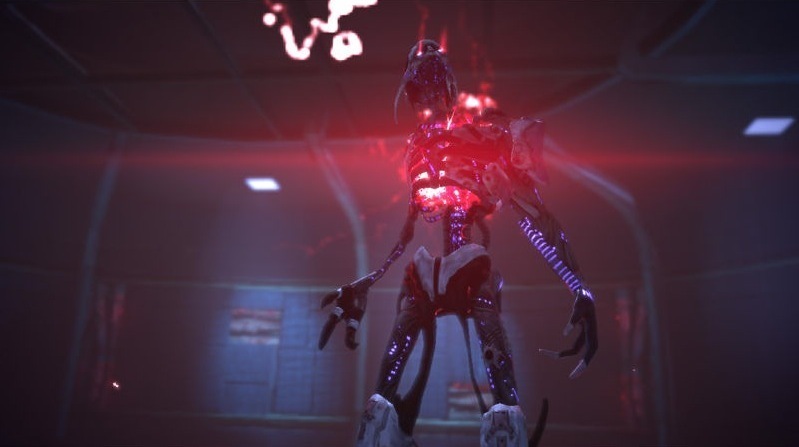 As many of you may have heard, BioWare's Casey Hudson, producer of Mass Effect, asked via his twitter account whether the announced Mass Effect 4 should be a prequel or a sequel. I have a better question: Why are you making Mass Effect 4? This isn't a question that comes from my deep-seated dislike of the ending of Mass Effect 3. I happily admit that I don't like the ending, but that's not why the question of whether the game should be a prequel or sequel disgusts me. This is a horrible question because it demonstrates unequivocally that there is no vision clear vision for Mass Effect 4. It tells me beyond all doubt that Mass Effect 4 should not be made, or at the very least, it should not be made with Casey Hudson at the helm. Asking fans for ideas of the setting in this way indicates that either Casey Hudson and whomever else was involved in green-lighting this project does not have a vision for the game except that it must be "Mass Effect 4". This is a clear indication that the only reason that it is a Mass Effect game is because it is a bankable IP that has sold millions of copies previously. That's it. All I can say is: Shame on you. I have possession of the intellectual property! You might think I'm being a bit harsh on Casey Hudson here, but he is ultimately in charge of the IP. The buck stops with him, which means he has to own it, and if he doesn't have the vision of what the next game in the series should be, then he needs to hand the reigns to someone who does. If he's not doing that, then he's not doing his job properly, nor is he treating the series, its fans, or the IP itself with respect. The reason this question is particularly abhorrent because if there is one thing that gamers and the gaming industry as a whole has a surplus of, it is ideas. The industry is filled with creative people and more ideas than could ever possibly turned into shippable games. To have to ask fans "what game should we make" indicates that the people behind the project don't have that vision and don't have a clear picture of what they want to do except to make a game that is part of a franchise. This is kind the of attitude that gives us the stale churn of titles over and over again, what allows companies to get away with just delivering the same old formula just to get sales. 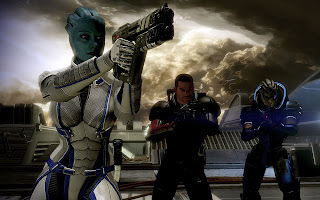 To do this in any genre demonstrates a lack of imagination, but do it in the RPG genre in which storytelling is such a core element of the experience is a travesty for existing Mass Effect titles as well as the RPG genre as a whole. What do you mean you don't have a story? 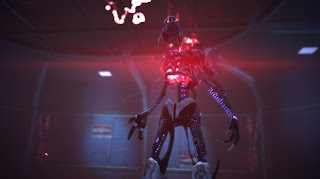 I understand that the content of a new Mass Effect game might be a touchy subject given the backlash against the ending of Mass Effect 3, but trying to make another game without a clear vision and strong idea of what game you want to make and why is only going to result in the production of an inferior and soulless product. If there was ever a way to attempt to repeat a backlash on par with that produced by Mass Effect 3, this would be how to start it. I could make a whole post about the delicate balance between balancing what gamers want and how much the developers should stick to their core vision. While Mass Effect 3 arguably pushed the boundary too far in the latter direction (though many applaud it for doing so), relying on the audience even decide the core setting or the story swings the pendulum far too much in the other direction. If you don't have a vision, don't make the game. Gamers deserve better, games deserve better, and developers deserve better. In this final post on the Assassin's Creed series, I'm going to talk about arguably the most important aspect of the series - the gameplay itself. I've left this discussion to last because so much of the development of the game mechanics has been influenced by the other factors in its development. The shifting focus of the series and changes in other aspects of the design of the games is inherently related to how the game is played. This truly should allow anyone to appreciate the myriad of factors that have to come together in order to create a cohesive gaming experience. Games should be designed such that all these factors come together effectively. Initially the game was a concept and an ideal more than a comprehensively designed gameplay experience. It was a sandbox with the primary character as a free-running assassin, and this is entirely reflected in the way the game plays out. It represented an interesting experiment that delivered a large world to the player, but gave them fewer direct reasons to explore it, instead rewarding those who wanted to roam of their own accord. Structured gameplay was minimal and mostly consisted of a small stable of repetitive tasks. Yet the designers recognised the shallow nature of the first experience and sought to expand upon it. This was a vast success in the second game, with the transformation in narrative and gameplay design leading to a superior and varied experience for players. Some of additions were not particularly exciting, races in particular being a somewhat tedious addition, and these rapidly dropped in number in Brotherhood and Revelations. The increased variety in mission design and even changes to mechanics and structure are of significant note throughout the series. Providing tangible benefits from doing additional content is something the series has always tried to do, firstly by provided increased health, then subsequently by making the player money, advancing recruits, and allowing them to buy better gear to make the do more damage or increase their health. Unfortunately, the designers have never seemed to quite pull this off entirely successfully. 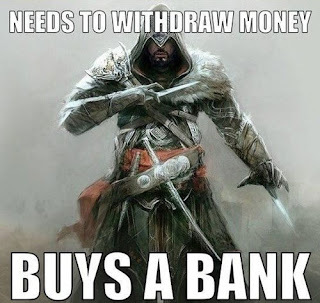 The first game's side content just ended up being repetitive and tedious, and in AC2 it was quite feasible to end up rolling around in ridiculous amounts of money with nothing to spend it on. Brotherhood and Revelations did reign this tendency in by introducing big money sinks, but aside from a few key valuable items, most of the point of making money was to spend money to make more money. The design was such that the goal was just a goal that helped fulfill that same goal, so ultimately didn't feel that rewarding for the player. Subtle changes to stealth mechanics both made stealth more successful and viable, but at the same time, perhaps made it feel less special and involving for the player. The ditching of the "active blending" from AC2 is perhaps the biggest step back for player involvement in stealth. Don't make stealth a simple "push button" like it was in the original game. That's neither challenging nor interesting for the player. It should require some effort on their part. The changes to notoriety in Revelations came a close second to this step backwards when it came to gameplay. Managing notoriety was never particularly challenging, and seemingly this led the designers to believe that it wasn't particularly valuable. However, ditching it in favour of templar awareness was a very poor decision. Managing "templar awareness" for the sake of preventing a potential attack on an assassin den was far less personal and engaging, and had less direct impact upon the player. The player typically had to perform a significant number of "unacceptable" actions after hitting maximum awareness to provoke an attack, which meant that getting a full meter didn't seem like cause for concern. 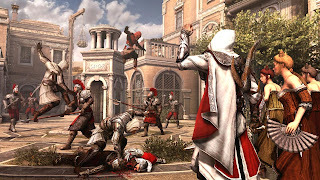 A notorious Ezio did potentially have to makes changes to his behaviour (even if small or subtle) to avoid attracting attention or at least minimising it. The better choice would have been to tweak the consequences of attaining notoriety and making it more difficult to reduce notoriety. The abundance of posters made it a trivial task to keep notoriety low, and heralds could easily be bribed and then pickpocketed for a significant decrease in notoriety. If the number of posters had been dropped, and pickpocketing a herald resulted in a vast increase in notoriety, then a far better balance would have been struck. Or perhaps offering increased dangers but with a potential small bonus to performing actions/missions while notorious would have provided a better risk/reward system for players. Finally, it would be remiss of me to fail to mention the combat and assassinations in the game in this discussion. The introduction of additional assassination methods as of AC2 made the series remarkably better. Actually being able to leap and kill someone, or toss them down onto the street while hanging on a ledge was a huge step forward for player freedom. But this isn't the only place where combat took a step forward. The variety in enemies provided a significant improvement in combat across the series. Requiring players to switch up their tactics a little made combat more interesting, even though the difficulty has never really ramped up across the games. 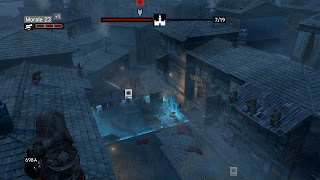 The variety in weaponry provides a range of tools that allows the player to switch up their killing method and their attack style, from fast and furious to slow but lethal. The only potential drawback here is that as the series has progressed, there are arguably too many options with too little difference between them. Why is the crossbow more advantageous than knives, and which bomb loadout should the player use, and how useful are they really? There's a lot of choice, but the differentiation between those choices seems minimal, meaning that those choices don't really seem to offer a whole lot to the player. Crossbows and throwing knives and assassins... oh my! The greatest problem with combat is that the player doesn't really ever feel like they are under significant threat, and even when they can take a sound beating quickly (as can happen in Revelations), it doesn't really provide that sense of threat or danger to the player with any meaningful feedback until the player is almost dead. 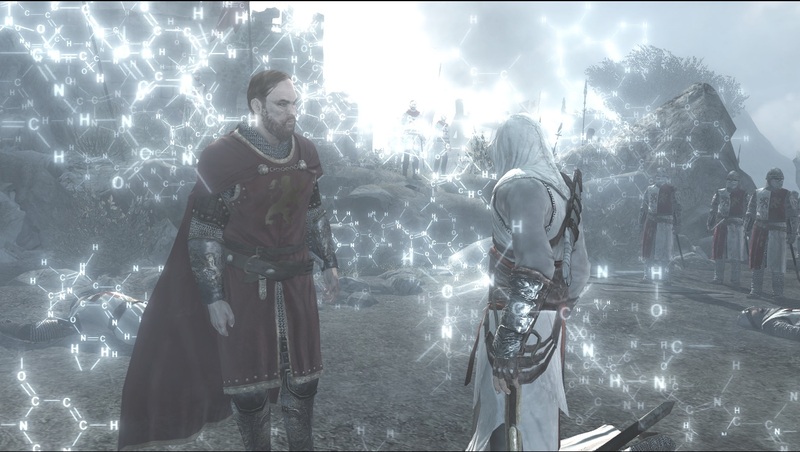 Just like the concept of the animus itself, there's very little "tactile" or tangible feedback to the player. Combat has never been difficult or a challenge because the fighting system has very little individual complexity. There's no combos like a fighting game or real individual move variety like a beat-em-up. Mostly it's a simple choice of "enemy X, attack A", enemy Y, attack B" with little to no difference in overall approach. There's no fluidity to the system that allows for the player to have free flowing combat when compared to something like Batman: Arkham Asylum/City. If the Assassin's Creed series wants to continue to develop, this is they key area of gameplay that designers really needs to concentrate on. Overall, the first four entries in the Assassin's Creed has been interesting titles. With varying strengths and weaknesses, this franchise offers an insight into how developers seek to change their formula and attempt to keep a series fresh while retaining true to the core premise of a series. If all the strong points of the series were combined in a single title, you'd have a truly excellent game, but the difficulty that the design team seems to have had thus far is picking how to tweak those aspects to obtain the right balance to fit the overall creative direction. I'll likely make another post on how well they have (or haven't) managed this when I get around to playing Assassin's Creed 3 - until then, I'm calling a close to my commentary on this series. 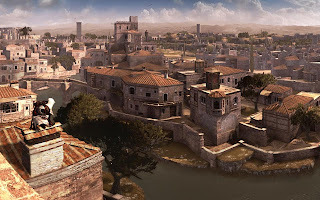 With the Assassin's Creed series, an aspect that warrants particular mention is the presentation of the game, not just in terms of graphics and art style, but the means in which events, characters and landscapes are provided to the player. No, I haven't played the third game yet, so I can't add it to the ongoing discussion. The series started off with an expansive yet minimalist presentation style. Cutscenes were done such that the player always retained control of Altair with their semi-interactive style, with the only real non-interactive sequences being the panoramic camera sweeps upon approaching a city for the first time, or synchronising from a viewpoint. Even when control was removed from the player, the cinematics conveyed a sense of scale and completeness of the environment. AC1 was presented as a giant and finely crafted sandbox for the player to explore with as few constraints as possible, and the presentation and gameplay supported this. The problem with an enormous sandbox is that it can potentially result in a limited about of designed gameplay, an inherent problem of the original game. Thus AC2 came in with its expanded story, but consequently a more prescriptive presentation style. The quicktime events of the cutscenes disappeared, which while perhaps making the player feel less involved, it ensured that the presentation of the cinematic sequences were crafted for maximum effect, with every shot delivering nuance of story and character. While this does lose some freedom for the player, the increased impact of the narrative is arguably worth it. The quicktime button events of AC2 were far worse, but these (fortunately) happened infrequently enough that the player didn't really have to worry about them, they didn't make much difference to the cutscene sequences, and they were mercifully dropped after this game. A changing presentation resulted in a tighter experience from a narrative and gameplay perspective, and focused the player on specific areas and zones. Vast areas that were explored a single time (if at all) were ditched in favour of smaller environments that the player could become familiar with. 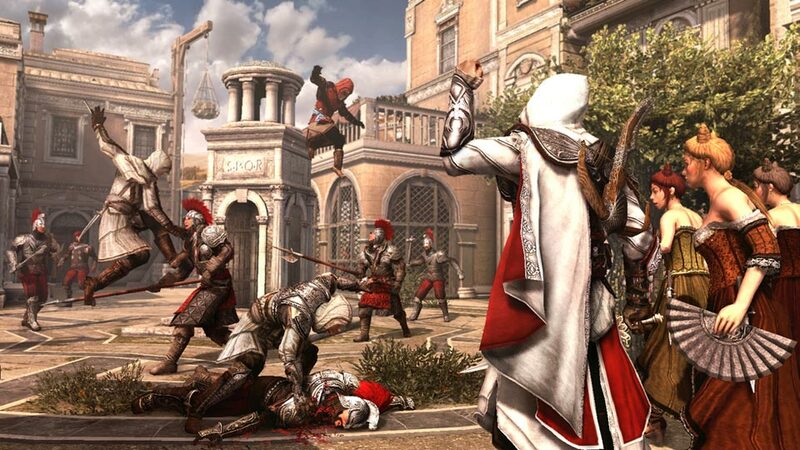 This helped provide additional impact for the more personal story of Ezio, as it helped the player associate with the concept that he was fighting for people and places that he cared about. 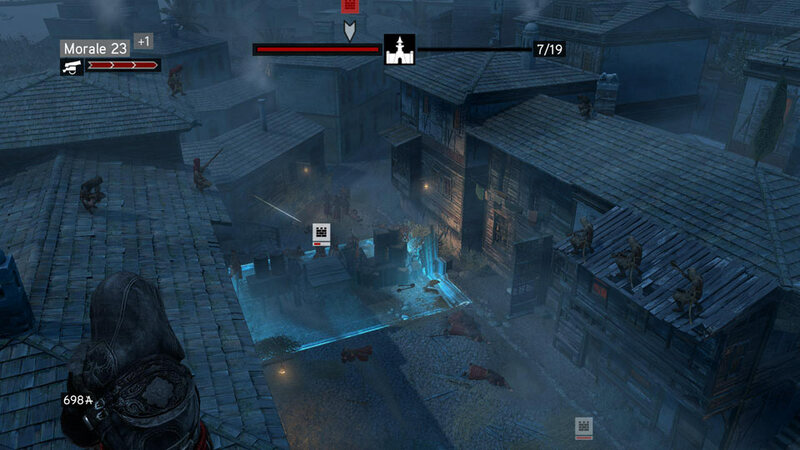 While this was perhaps slightly undone by the near identical assassin recruits you trained and promoted, it still increased the player's level of engagement with the setting. There was an overall improvement in the graphical quality of the series as well. While the long draw distance to see vast panoramas has remained fairly constant, the diversity and complexity of the environments has provided some really stunning scenes for the player to view. The fact that the series deals with some pretty amazing architecture definitely doesn't hurt at all, but the art team still manage to pull the detail off with definite skill. The improvement in the character models and facial appearance is also noteworthy, which was fairly essential given the increased focus on a more cinematic presentation, leading to more close up shots of character's faces that requires that higher level of fidelity. The ability to choose a desired colour scheme for Ezio's outfit was just another small bit of icing on the cake that added a little more character. 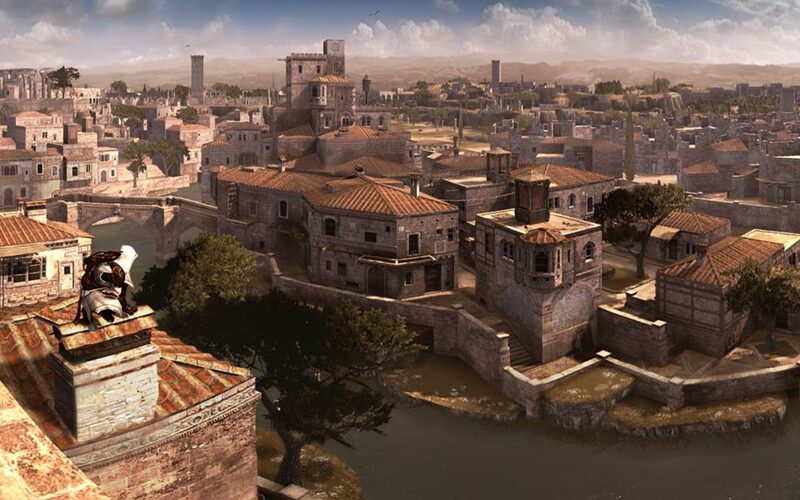 In the first four games, Assassin's Creed moved from wide empty areas to tightly crafted cities. While the impressive nature of the level design of the original game cannot be denied, a narrower focus has probably allowed more players to better appreciate the level of detail and effort that has gone into creating the environments for each game. The presentation of the series has improved along the way even if the scope diminished, and it could be argued that the games became better as a result.